My family was in a hurry and needed to eat so I did what any other responsible father would do, I took them to the drive-thru of Wendy’s–we love Wendy’s. Everyone finds something they like, and they have a killer value menu. The order was locked and loaded when I pulled up to the speaker, “Welcome to Wendy’s may I take your order?”, “Yes, I’d like two orders of Chicken nuggets…” at which point I was interrupted. “You said a chicken sandwich?” “No, two chicken nuggets.” “Two chicken sandwiches?” I smiled at my family trying to be patient, “No, it’s two chicken nuggets” “OH, ok, chicken nuggets.” It was at this point that my 6-year-old daughter yelled out from the back seat loud enough for the speaker to pick it up, “Way to go genius!” Oh my—I’d like to blame it on her mother, but the truth is, I was thinking the same thing; I just wasn’t going to say it! As a leader, there are multiple times a day you think “Way to go genius!” And after a period of time, you begin to think, there’s no way I can work with these people; everyone is an idiot–but me! Why can’t you do things the way I would, why didn’t you think first? After all, if everyone would just do things the way I would, then this world would be a much better place. I’m sure I’m not the only one who feels this way. And if you don’t, then you’re holy, a liar or an idiot. 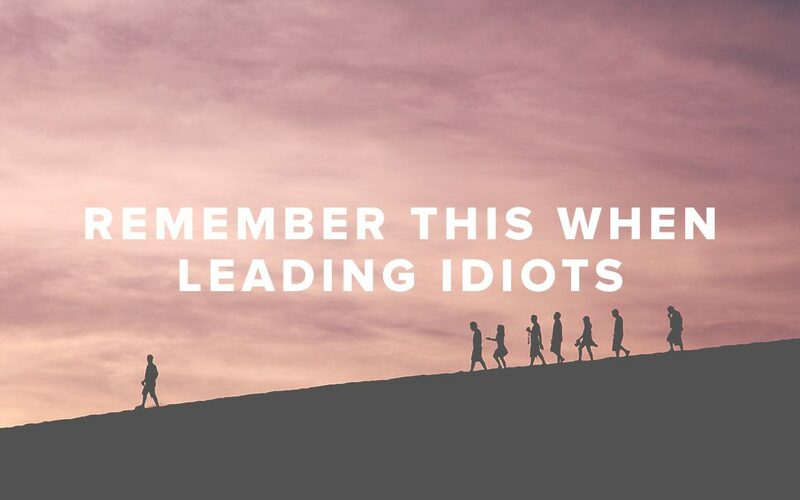 Jesus seemed to deal with idiots–but stayed with them. Now I know what you’re thinking “he was God and He was perfect”. But if anyone had the right to look down on others, it was the one above all. And think about all the opportunities he had to view everyone else as not worthy of him. Scripture teaches he was tempted in every way, and I think his temptation to not look at all of his disciples and say, “YOU’RE AN IDIOT. WHY AM I WASTING MY TIME WITH YOU!” might have been one of his toughest battles. For instance, one day Jesus has just received news that his cousin, John the Baptist, has been beheaded. Needing to process this grief He withdraws for solitude. But the crowds won’t let Him rest–they pursue Him. Where is He? Where’s the miracle worker? Think about the lack of emotional intelligence here from the crowds. They should have known just to give Him some space. I would be tempted to let the crowds have it, “can’t you see I need some alone time? !” But Jesus stops and takes care of the sick. In fact, Matthew tells us He had compassion on them. And what about the lack of care from the disciples? They don’t even seem to protect Jesus, they not only let the crowds find Him, but they come up and present problems and demands. “Hey, everyone’s hungry! And by everyone, I mean 5,000 people.” Yet Jesus doesn’t overreact, He doesn’t withdraw, instead, He saves the day. What did Jesus know that we continue to miss? He knew that for His ministry to continue it would take people. He knew that despite the fact that the church would be full of idiots, it would be better together. Leadership requires that we learn how to do life better together. When I’m with others I not only see the value they bring me, but I’m reminded every time I see an idiot they see one in me too. And as difficult as the team approach can be, we truly do accomplish more together. If you’d like to know more, check out my latest book Better Together – Surprising Truth for introverts, extroverts, control freaks, free spirits, people persons, curmudgeons and especially you. Great post. It made me laugh a little too lound and delivered a powerful message. Thank you! I try not to be an idiot but you know how that goes …….. When I finally let go and allow God to take control then it’s amazing how working together is better…. and puts a smile on your face.